これは、Azure CDN Premium from Verizonのみの機能です。Azure CDN Standard 製品では利用できません。This is a feature of Azure CDN Premium from Verizon only, and is not available with Azure CDN standard products. CDN の機能の比較については、「Azure CDN product features」(Azure CDN 製品の機能) を参照してください。For a comparison of CDN features, see Azure CDN product features. 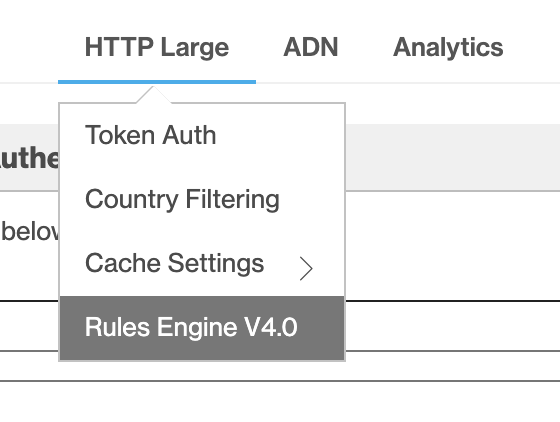 Azure CDN ルール エンジンを使用すると、HTTP 要求を処理する方法をカスタマイズできます。The Azure CDN rules engine allows you to customize how HTTP requests are handled. たとえば、特定の種類のコンテンツの配信のブロック、キャッシュ ポリシーの定義、HTTP ヘッダーの変更などを行うことができます。For example, blocking the delivery of certain content types, defining a caching policy, or modifying an HTTP header. このチュートリアルでは、CDN 資産のキャッシュ動作を変更するルールを作成する方法について説明します。This tutorial demonstrates how to create a rule that changes the caching behavior of CDN assets. 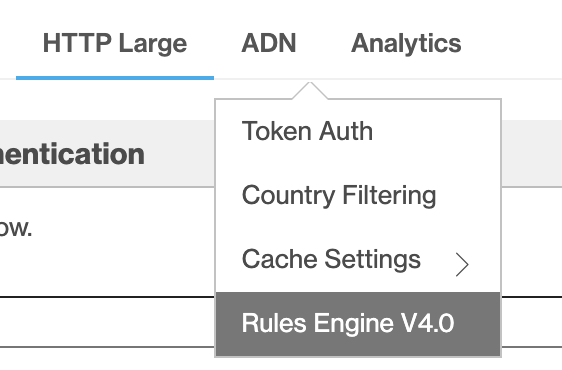 ルール エンジンの構文の詳細については、「Azure CDN ルール エンジンのリファレンス」をご覧ください。For more information about the rules engine syntax, see Azure CDN rules engine reference. [HTTP Large](HTTP ラージ) タブを選択し、[ルール エンジン] を選択します。Select the HTTP Large tab, then select Rules Engine. [ADN] タブを選択し、[ルール エンジン] を選択します。Select the ADN tab, then select Rules Engine. ADN は、DSA コンテンツを指定する際に Verizon で使用される用語です。ADN is a term used by Verizon to specify DSA content. ここで作成したルールは、プロファイル内の DSA に最適化されていないエンドポイントでは無視されます。Any rules you create here are ignored by any endpoints in your profile that are not optimized for DSA. 新しいルールのオプションが表示されます。The options for a new rule are displayed. 複数の規則が表示される順序は、これらの規則の処理方法に影響します。The order in which multiple rules are listed affects how they are handled. 前の規則で指定したアクションは、後続の規則でオーバーライドされます。A subsequent rule may override the actions specified by a previous rule. [名前 / 説明] テキストボックスに名前を入力します。Enter a name in the Name / Description textbox. ルールを適用する要求の種類を指定します。Identify the type of requests the rule applies to. 既定の一致条件の [常に] を使用します。Use the default match condition, Always. ドロップダウン リストには複数の一致条件が用意されています。Multiple match conditions are available in the dropdown list. 現在選択されている一致条件については、左側の青い情報アイコンをクリックしてください。For information about the currently selected match condition, select the blue informational icon to its left. 条件式の詳細な一覧については、ルール エンジンの条件式に関する記事をご覧ください。For a detailed list of conditional expressions, see Rules engine conditional expressions. 一致条件の詳細な一覧については、ルール エンジンの一致条件に関する記事をご覧ください。For a detailed list of match conditions, see Rules engine match conditions. 新しい機能を追加するには、[機能] の横にある + をクリックします。To add a new feature, select the + button next to Features. 左側のドロップダウンで、 [内部の最長期間を強制する] を選択します。In the dropdown on the left, select Force Internal Max-Age. 表示されるテキスト ボックスに、「 300」と入力します。In the textbox that appears, enter 300. その他の既定値は変更しないでください。Do not change the remaining default values. ドロップダウン リストには複数の機能が用意されています。Multiple features are available in the dropdown list. 現在選択されている機能については、左側の青い情報アイコンをクリックしてください。For information about the currently selected feature, select the blue informational icon to its left. [Force Internal Max-Age](内部の最長期間を強制する) では、資産の Cache-Control ヘッダーと Expires ヘッダーをオーバーライドして、CDN エッジ ノードが配信元の資産を更新するタイミングを制御します。For Force Internal Max-Age, the asset's Cache-Control and Expires headers are overridden to control when the CDN edge node refreshes the asset from the origin. この例では、CDN エッジ ノードは、資産を 300 秒間 (5 分間) キャッシュしてから、配信元の資産を更新します。In this example, the CDN edge node caches the asset for 300 seconds, or 5 minutes, before it refreshes the asset from its origin. 機能の詳細な一覧については、ルール エンジンの機能に関する記事をご覧ください。For a detailed list of features, see Rules engine features. [追加] を選択して新しいルールを保存します。Select Add to save the new rule. 次に、新しい規則は承認を待機します。The new rule is now awaiting approval. 承認されると、状態が [保留中の XML] から [アクティブな XML] に変わります。After it has been approved, the status changes from Pending XML to Active XML. ルールの変更が Azure CDN に反映されるまでに、最大 10 分かかる場合があります。Rules changes can take up to 10 minutes to propagate through Azure CDN.